by Chris Woodford. Last updated: August 18, 2018. On chill winter days, our thoughts tend to turn, not surprisingly, to better ways of heating our homes. Here in the affluent developed world, we love the cosy-convenience of natural-gas, oil, and electric-powered central heating, though their dependence on fossil fuels could mean a heavy price for generations to come in the form of dramatic climate change. Meanwhile, many people living in developing countries still rely on wood fuel (pretty much the only reliable energy source humans had before the 19th century). Burning wood may seem primitive, but it's now enjoying a huge renaissance as one of the most environmentally friendly forms of home heating. Plants grown for their energy value are called biomass and you can now get home biomass furnaces (sometimes called biomass boilers) that are simple, convenient, and almost fully automatic. They're good for the planet and they can often work out good for your pocket—typically saving a great deal of money compared to the more expensive fuels such as oil and electricity. How they do work? Let's take a closer look! Photo: Biomass, such as wood grown for fuel, is more environmentally friendly than fuels such as coal and gas. If it's a waste product of industry, using it in a wood-burning stove like this avoids sending it to landfill—so it's doubly good for the planet. Chart: Biomass supplied about 5 percent of the energy used in the United States in 2017. 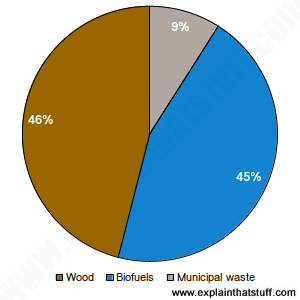 Although you might expect most of it comes from wood, quite a lot comes from biofuels (mostly ethanol) as well. Use of biofuels has been increasing for years, notching up to 47 percent in 2017, though it has fallen slightly from the 2016 figure of 48 percent in response to growing environmental concerns. Wood comes in at 44 percent (up from 41 percent in 2016). Figures don't add to 100 percent because of rounding. Data from US Office of Energy Administration, 2018. Biomass is a fashionable, fancy word that really just means plants (or other once-living things) used as fuel (especially ones grown specifically for that reason). Wood fuel gathered by people in an African country is biomass; ethanol, used to make diesel for car engines, is also biomass; and chicken manure used to fire power plants is biomass too. The great thing about biomass is that it's a kind of renewable energy: plants grow using sunlight, which they convert into chemical energy and store in their roots, shoots, and leaves. Burning biomass releases most of that energy as heat, which can we use to warm our homes, generate electricity, and fuel our vehicles. Biomass is more environmentally friendly and sustainable than fuels such as coal for three main reasons. Unlike coal (which takes many millions of years to form from plant remains), biomass can be produced very quickly and we can easily grow new plants or trees to replace the ones we cut down and burn (in other words, biomass can be genuinely sustainable). Plants absorb as much carbon dioxide from the air when they grow as they release when they burn, so in theory there is no net carbon dioxide released and burning biomass does not add to the problem of global warming. (That's why biomass is sometimes called a carbon neutral form of energy.) I say "in theory" because in practice growing, harvesting, and transporting biomass may use energy (tractors or trucks running on oil might well be involved, for example) and that reduces the overall environmental benefit. Also, new young trees don't absorb as much carbon dioxide as the older trees that are cut down. Biomass is often simply wasted or sent to landfill. Burning something like waste wood offcuts from a lumber yard or chicken manure from a poultry factory not only gives us energy, it also reduces the waste we'd otherwise need to dispose of. What is a biomass furnace? Photo: Right: Wood-burning stoves haven't changed all that much over the years, though modern ones are designed to burn their own waste gases so they generate less pollution. This traditional stove dating from the 1860s is at Fort Larned in Kansas and was designed to get soldiers through harsh winters. Photo by courtesy of US National Park Service: Fort Larned National Historic Site. People tend to burn biomass in two ways. The simplest method is to use a wood-burning stove, an enclosed metal box made from something like cast iron, with opening doors at the front where the fuel is loaded up and a small smokestack called a flue to carry away carbon dioxide, smoke, steam, and so on. This generally provides heat in a single room, much like a traditional coal fire. A biomass furnace is a more sophisticated option that can heat an entire building. Unlike a wood-burning stove, a biomass furnace does the same job as a central-heating furnace (boiler) powered by natural gas, oil, or electricity: it can provide both your home heating and hot water and it can even power modern underfloor central heating. It's not like a dirty and labor-intensive coal-fire and doesn't require huge amounts of starting up, cleaning, or maintenance. All you have to do is load in your biomass (generally, you'd use wood pellets, wood chips, chopped logs, cereal plants, or a combination of them) and periodically (typically every 2–8 weeks, depending on the appliance) empty out the ash, which you can recycle on your compost. Photo: You can do anything with biomass that you can do with other fuels. This large generator turns woodchips into electricity. Photo by Jim Yost courtesy of US Department of Energy/NREL. While wood-burning stoves have to be manually filled up with logs, biomass furnaces are often completely automated: they have a large fuel hopper on the side that automatically tops up the furnace whenever necessary. Unlike with a coal fire, you don't have to mess around trying to get the fuel lit: biomass furnaces have simple, electric ignition systems that do it all for you. It's perfectly possible to run a system like this all year round, but in summertime when you don't need home heating it might be excessive to have your furnace running purely to make hot water. Many people switch off their furnaces entirely for the summer months, relying on solar thermal hot water systems (glass panels on the roof that warm up water using the Sun's heat), electrical immersion heaters (a heating element fitted inside a hot water tank), or an electric shower to tide them through until fall or winter. It's perfectly possible to couple together a biomass furnace with a solar hot-water panel so the furnace switches on when the panel can't produce enough hot water for your needs. Photo: Biomass furnaces scale up very well: this is a 50megawatt power plant in Burlington, Vermont that produces electricity for local people using wood fuel. Photo by Dave Parsons courtesy of US Department of Energy/NREL. Biomass furnaces and wood-burning stoves are generally considered to be far more environmentally friendly than home heating systems powered by fossil fuels, but one drawback is worth bearing in mind: burning biomass is cleaner than burning coal but still produces air pollution. If you're considering buying a biomass stove or furnace, ask about emissions (sales brochures usually mention how much dust, carbon monoxide, and oxides of nitrogen appliances produce); and be sure to find out whether there are pollution or other planning restrictions in your area before you commit yourself to an expensive purchase. And as with any form of home heating that involves burning fuel, be absolutely sure to install a carbon monoxide detector for your own safety and health: badly ventilated heating appliances can kill, whether they're environmentally friendly or not! How does a wood-burning stove work? Photo: A typical Franklin stove in a home sitting room. Photo courtesy of US Library of Congress. What could be simpler than a wood-burning stove? You might think there's nothing new anyone could add to the basic idea of burning stuff in a fire, but you'd be surprised! Inventors have been tinkering with better ways to release heat from fire—one of humankind's oldest discoveries—since the dawn of human civilization. 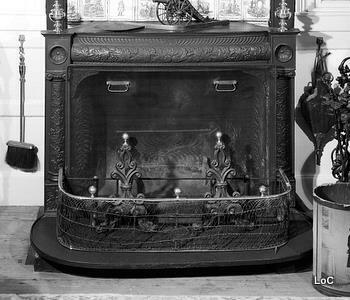 In 1741, one of our most prolific inventors, Benjamin Franklin, earned a name for himself with the Franklin stove, which used a sturdy fuel basket made from cast iron to circulate air more thoroughly, burn fuel more completely, and so produce less smoke. Modern stoves are much more efficient than early ones because combustion (burning of the fuel) happens in a two-stage process. First, there's the obvious primary combustion where the main fuel burns with oxygen from the air to release heat. Fuel is made up of hydrocarbons (molecules built from hydrogen and carbon) and combustion is a chemical reaction in which hydrocarbons are rearranged to make other molecules, giving off energy in the process. In theory, if combustion happens perfectly, it releases heat energy and produces only carbon dioxide and water (steam). In practice, we don't get complete combustion, so smoke (unburned particles of carbon), carbon monoxide, and other gases are produced too, wasting energy, reducing efficiency, and making pollution. That's why, in a well-designed stove, there's also a process of secondary combustion, where the unburned carbon in the smoke is itself burned to release further energy and reduce pollution. This is usually achieved by making a stove work in what's called downdraft mode. Instead of simply having a flue open directly above the burning fuel (allowing unburned fuels and gases to escape), there's an extra flue at the bottom and around the back of the stove. With this open, smoke and combustion gases initially move downward, through the combustion zone, before passing out safely through the back flue. Artwork: A typical wood-burning stove has baffles (metal gates) that open and close to "switch" two separate flues on and off. With the top flue open, the stove works just like a conventional open fire. Air is drawn upward, there is little or no secondary combustion, and energy is wasted as hot, unburned fuel gas exits the flue with unnecessary smoke pollution. With the top baffle (blue) closed, the upper flue is closed too. 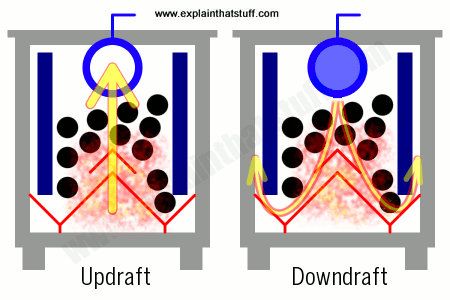 Air is now drawn downward through the fire, encouraging secondary combustion (burning smoke and waste gases left over after the primary combustion) and releasing extra energy, before the remaining waste gases pass through heat exchangers and exit through a second flue (not shown) around the back. US DOE/NREL: Bioenergy Research: The latest research into biomass technologies from the National Renewable Energy Laboratory. The Biomass Assessment Handbook: Bioenergy for a Sustainable Environment by Francisco Rosillo Calle et al (eds). Routledge, 2015. A high-level review of biomass as an environmental solution, rather than a hands-on book for people who want to install their own biomass furnace. Homeowners' Guide to Renewable Energy by Dan Chiras. New Society, 2011. A more practical guide that reviews and compares different renewable energy approaches, including solar, wind, and biomass. Chapter 6 (Wood Heat) covers retrofitting fireplaces, wood-burning stoves, pellet stoves, and masonry heaters. Energy Kids: Biomass: A clear and simple introduction from the U.S. Energy Information Administration with a good selection of facts, statistics, and charts. Biomass: Fuelling Change by Niki Walker. Crabtree, 2007. A 32-page introductory book for grades 5-8. Energy by Chris Woodford. New York/London, England: DK, 2007. My own, more general introductory book about energy compares all the different forms of renewable and fossil energy. Suitable for ages 8–12. Robotic Kelp Farms Promise an Ocean Full of Carbon-Neutral, Low-Cost Energy by Evan Ackerman, IEEE Spectrum, March 15, 2017. Biomass produced at sea solves one of the major problems of traditional biofuels (they take up land needed for for food production). Most wood energy schemes are a 'disaster' for climate change by Matt McGrath, BBC News, February 23, 2017. Why biomass schemes usually fall far short of carbon neutral. Smog in the cities: the truth about Britain's dirty air by Robin McKie, The Guardian, January 29, 2017. 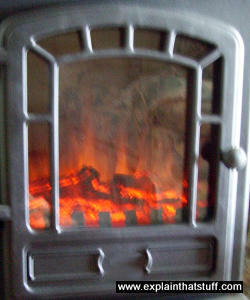 Wood-burning stoves are implicated in the latest air pollution alerts from the UK. Why logs are twice as dirty as diesel by Gary Fuller, The Guardian, December 11, 2016. Wood fires might be cosy, but their smoke contains high levels of toxics. India Increases Effort to Harness Biomass Energy by Amy Yee. The New York Times, October 8, 2013. How much of a contribution can biomass make to the energy needs of India's 1.2 billion people? No fire without smoke: wood stove trend creates a burning issue by Lucy Knight. The Guardian, July 3, 2013. Growing use of wood burners is prompting fears for air quality in Australia. 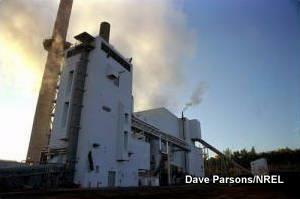 The Inconvenient Science of Biomass Power by Peter Fairley. IEEE Spectrum, June 1, 2012. Critics argue that leaving forests intact is a better way of tackling climate change than burning them for biomass. 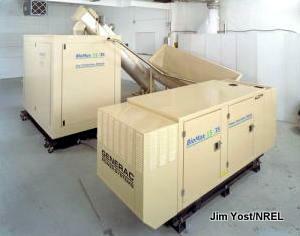 Burning Biomass to Charge Electric Vehicles Beats Fueling Cars with Ethanol by Willie D. Jones. IEEE Spectrum, May 1, 2009. Biomass gives more "kilometers per hectare" than ethanol, new research finds.